A hole-in-one shot won a new Porsche for Aleef Adam. On April 15, 2013, 116 golfers took a swing at ending global poverty by raising $100,000 in a tournament at Atlanta’s East Lake Golf Club. The annual Atlanta Partnership Golf Tournament is an initiative of the Aga Khan Foundation U.S.A. (AKF USA), a worldwide nondenominational development agency established by His Highness the Aga Khan to work for the vulnerable in Africa and Asia, regardless of their gender, origin, or religion. 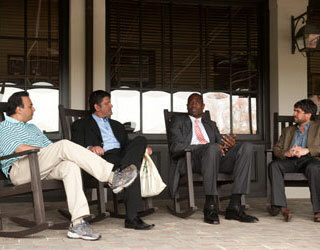 Basketball giant Dikembe Mutombo with participants of the Atlanta Partnership Golf Tournament on April 15, 2013. The tournament attracted corporate executives, civic leaders, and local celebrities. Guests included Dikembe Mutombo, the Congolese-American NBA star center who took the Houston Rockets to the 2009 NBA championship playoffs. The tournament began with a shotgun start at 10:00 a.m. First-place winners of the Partnership Cup were Josh Kenny, Tommy Thompson, and Doug Vollberg of Thompson-Kenny LLC. They will have their names engraved on the prize cup. The award for longest drive went to Matthew Godfrey, who received a Bulova watch as prize. And remarkably, the hole-in-one prize of a 2-year lease on a new Porsche went to lucky Aleef Adam. 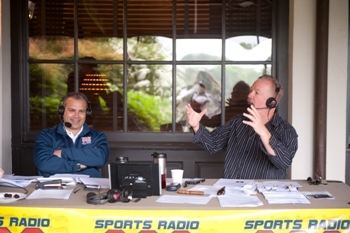 Local Sports Radio 93.7 FM held live coverage of the friendly competition. After the tournament, golfers enjoyed an afternoon of live and silent auctions and an awards ceremony. With over half of the world’s population living on less than $2 per day, one of the featured speakers, Murad Abdullah, President of the Shia Imami Ismaili Council for Southeastern USA, noted that these tournaments for poverty alleviation projects create “partnerships with government agencies and the private sector to help communities become self reliant.” Contributions make a tremendous impact in creating opportunities for girls in Afghanistan to go to school, for farmers in Mali to feed their families, and mothers in India to lead healthy lives.